Aileen Hall was born December 9, 1926, at Banner, Kentucky, the fifth of eight children. Her parents were Jack and Nancy Akers Sellards. On June 5, 1946, she married Walter Hall, the love of her life. They made their lifetime home in Betsy Layne. Besides her parents and husband, Walter, she was preceded in death by two brothers, David Estill and Edward Graham Sellards, two sisters, Elsie Lykins and Sylvia Hall. She is survived by daughters Nancy Lee Niles husband Don of Wesley Chapel, FL & Rhonda Gale Kretzer, husband Doug of Stanville, KY; five grandchildren, David Walter Spradlin, Jonathan Spradlin, Leigh Ann Napier, Candice Henderson & Kelly Blackburn; eight great-grandchildren; Brian, Carson & Jordan Spradlin; Halle Kate, Kenley Jane & Ella Ryann Napier; John David & Addison Spradlin & a step-great Edie Kretzer. She is also survived by two sisters, Jewel Conn of Harold & Georgean Cecil of Stanville & a brother Jack B. Sellards of Corbin. 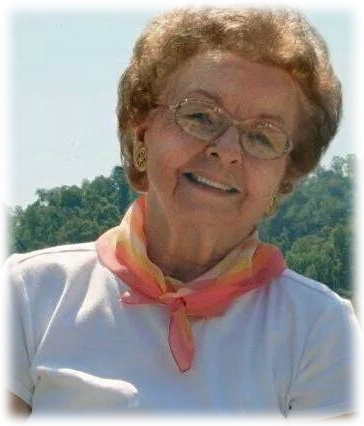 She was a member of Calvary Baptist Church for 65 years where she taught Sunday School for 52 years, served as church treasurer for 30 years. Her favorite role was adult Sunday School teacher where members of her last class made it her most enjoyable work. She always enjoyed working. She started with part time jobs, pumping gas & keeping books, while a student at Betsy Layne High School. During the war she was a server in a Detroit cafeteria. She was the youngest postmaster in Kentucky when her 37 year postal career began, first at Stanville and then at Betsy Layne. In her role as postmaster she became very involved in the National Association of Postmasters & served in various state & national offices. She was the first woman in the organization ever elected state president. After retiring from the postal service she worked 28 years as accountant & office manager at Vantage Point advertising agency. Writing was a hobby that proved helpful in all areas of her life. As a postmaster she wrote articles and columns for postal publications. Later she wrote feature articles for various publications & a regular column that ran 15 years in the Floyd County Times called Small World. She published two books: a book of poetry called Candlelight in 1976 & a memoir titled A Charge for the Angels in 2010. Funeral service will be conducted Friday, February 8, 2019 at 1:00 pm at the Calvary Baptist Church, Betsy Layne, with Tim McClanahan officiating. Burial will follow in the Davidson Memorial Gardens in Ivel. Visitation is from 5 pm until 9 pm on Thursday, February 7 in the Hall Funeral Home Chapel & from 12 noon until the time of service Friday at the church.